The most sacred icons of the Catholic Church are the Black Madonna and Christ child, which are found in Europe's most venerated shrines and cathedrals. Each year, millions of European pilgrims ritually humble themselves before the image of Black Mary and her child Jesus at Black Madonna sites throughout France, Germany, Spain, Italy, Belgium, Portugal and other Catholic countries. Many Black Madonna statues have the black paint literally kissed off of their hands and feet. In Poland, the Church encourages believers to pray to the Black Madonna of Czestochowa every morning before rising. It is reported that Pope John Paul follows this ritual. Time Magazine (June 11, 1979) reported on Pope Paul II's visit to Czestochowa's holiest shrine, which prominently displays "The Lady" known for centuries as the Black Madonna. At Our Lady of Koden (Poland), there are statues of white saints carrying pictures of Black Madonnas. Pilgrims throughout the ages have visited Black Madonna sites and left inspired, confident, relieved, or healed of their afflictions. 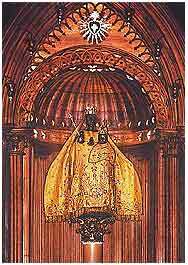 Today, there are over 300 documented Black Madonna sites in France alone!1 Sometimes they are hidden away in vaults, while the public is shown Madonnas with European features. [photo, right: The Black Madonna at the Abbey of Einsiedeln (Hermits) in Switzerland is visited by over a million people each year. Click here to view its glorious interior. 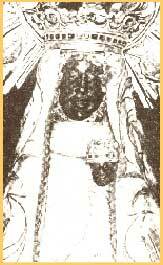 The Black Madonnas originally all had Africoid features before most of them were destroyed by iconoclasts. When they were replaced, the artists retained the dark skin color but, not being familiar with real Afrikans, gave European features to the paintings. 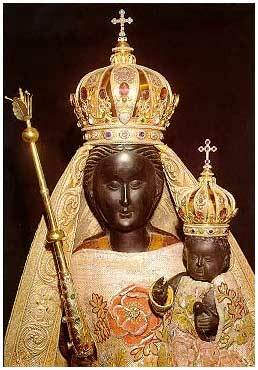 In cases where originals have survived, you may witness Africoid features on Mary and her child Jesus, such as the Black Madonna of Nuria, Spain ­called "the Queen of the Pyrenees." 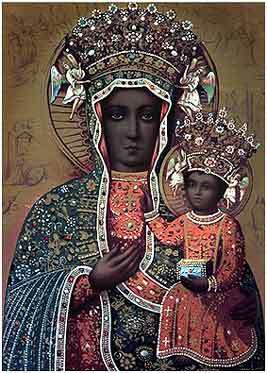 Russia's remarkable legacy of Black Madonnas and other Christian icons of dark skin is evidenced in the book, Russian Icons by Vladimir Ivanov, including the feature story of the Spring 1994 issue of Russian Life magazine, graced with a Black Madonna on its cover. 1) Watts, 18. 2) Higgens, vI, 138. "Mother of God" with her . 1) Saakana, 53-54. 2) Doane, 335. 3) Ibid., 337. 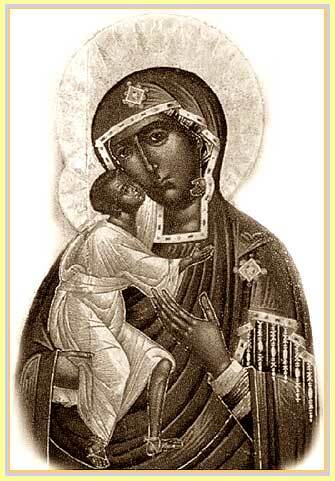 Click here for a Bibliography of The Black Madonnas of Europe, also by Runoko Rashidi. An overview of Black Madonnas is found on this single but lonnng webpage; the same Black Madonnas page is here in a different format. Black Madonnas in France: (left) in church of Molompize ; (center) in Chartres Cathedral --famous for its Labyrinth; and (right) Notre Dame de Bonne de Debutante, a Black-Blonde Madonna dating from 1930. France has the most Black Madonnas, over 300. For an extensive listing, general info, and quality photos of Black Madonnas throughout France, click here.